Cooperation is the cornerstone of lion social behavior. In a notorious case, a coalition of two adult male lions from Tsavo, southern Kenya, cooperatively killed dozens of railway workers in 1898. The “man-eaters of Tsavo” have since become the subject of numerous popular accounts, including three Hollywood films. Yet the full extent of the lions' man-eating behavior is unknown; estimates range widely from 28 to 135 victims. Here we use stable isotope ratios to quantify increasing dietary specialization on novel prey during a time of food limitation. For one lion, the δ13C and δ15N values of bone collagen and hair keratin (which reflect dietary inputs over years and months, respectively) reveal isotopic changes that are consistent with a progressive dietary specialization on humans. These findings not only support the hypothesis that prey scarcity drives individual dietary specialization, but also demonstrate that sustained dietary individuality can exist within a cooperative framework. The intensity of human predation (up to 30% reliance during the final months of 1898) is also associated with severe craniodental infirmities, which may have further promoted the inclusion of unconventional prey under perturbed environmental conditions. 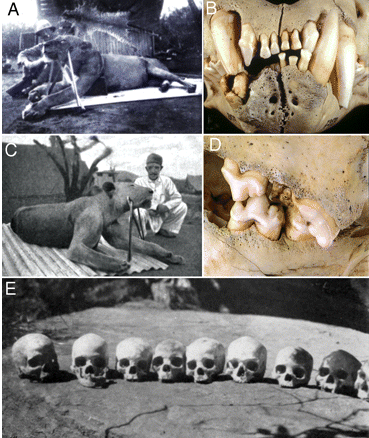 The man-eaters of Tsavo and a Taita ancestral shrine. (A) Lieutenant Colonel J. H. Patterson and lion FMNH 23970 shot December 9, 1898 (16) (FMNH photo archives no. z93658, Field Museum of Natural History). (B) Articulated jaws of FMNH 23970 revealing a fractured lower right canine (and subsequent root-tip abscess), missing lower incisors, supererupted upper right incisors, and rotation and malocclusion of the upper right canine. Cranial asymmetry of 23970 occurred after injury and before death. (C) Lion FMNH 23969 shot December 29, 1898. (D) Articulated jaws of FMNH 23969, revealing a fractured upper left carnassial with a double pulp exposure. (E) A Taita ancestral shrine photographed in 1929 by L. S. B. Leakey. Such a shrine results from the unusual funerary practices of the Taita; after approximately 1 year of burial in a seated position, skulls are exhumed, severed, and enshrined in ancestral caves or rock shelters.